The terms "criminology" and "criminal justice" are often used interchangeably even though they're not the same thing. If you ask 10 college students who plan to work as police officers what they were studying, chances are that half of them will tell you criminology and the other half will say criminal justice. The fields are definitely related, but you should be able to distinguish between the two if you're looking into this type of career. Criminology is the study of crime and its causes, costs and consequences. ​​Criminal justice is the system in which crimes and criminals are detected, detained, tried and punished. People who study criminal justice actually learn about all the different components and inner workings of the system. Three main components make up the criminal justice system: law enforcement, courts, and corrections. They work together to prevent and punish deviant behavior. Law Enforcement: This function is perhaps the most visible. Police officers are typically the first contact a criminal has with the criminal justice system. Police patrol communities to help prevent crimes, to investigate incidences of crime and to arrest people suspected of committing crimes. Criminals enter the court system after they've been arrested. Courts System: The court system consists of attorneys, judges and juries, as well as ancillary staff. The guilt or innocence of a suspect is determined in court. The suspect, now a defendant, is offered the opportunity to defend himself in court as evidence is presented. He is then either released or is found to have committed the alleged crime. 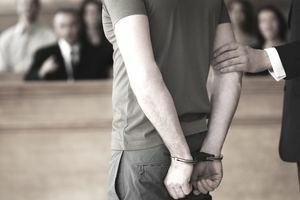 If he's found guilty, the suspect receives a sentence or punishment based on criteria set by the judge and by statute. The defendant is turned over to the corrections system after sentencing. Corrections System: The corrections system incorporates all forms of sentencing and punishment. It includes incarceration and probation. A convicted criminal is the responsibility of the corrections system until their full sentence is served or commuted. The criminal justice system has its roots in the Roman Republic and medieval England, which is one of the reasons why Latin remains the basis of the language of the courts. Concepts such as restitution and execution are carried over from ancient times, although other ancient punishments such as mutilation, flogging and branding have largely been done away with in industrialized countries as our sensibilities and understanding of crime have changed. Incarceration and the prison system only became widely used in the 1800s. When society deemed it necessary to separate a criminal from the population before that time, he was usually exiled and often threatened with death if he returned home. Another relatively new development in criminal justice is the modern police force. Once viewed as the duty and responsibility of every male citizen, maintaining safe and secure communities has now become a function of the government. The criminal justice system continues to evolve through the work of criminologists and law enforcement professionals as we search for ways to better serve victims, witnesses, society, suspects and convicted criminals. The study of criminal justice helps us learn better ways to solve a crime and protect citizens. Criminal justice offers a tremendous number of career options. Those interested in working in the field can find plenty of jobs in the courts, corrections or law enforcement systems.